So I am always looking for new and creative ideas ideas for new meals and side dishes. Plus at the same time not break the bank when it comes to cooking. 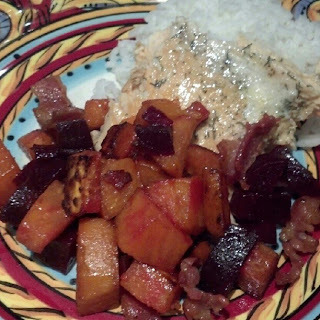 So the other night I made my fabulous Salmon in a envelope however this time I served it on a bed of rice with this fabulous warm Sweet Potato Bacon Beet Salsa. This is a great recipe to serve to your kids. My daughter thought the sweet potatoes were carrots and that I had cooked them with some sort of candy. In a large frying pan cook bacon until golden then remove bacon and set aside. Do not remove grease! Chop and peel a large sweet potato or yam in nickle size chinks place inside pan and cover so it will steam to for about 5 minutes. 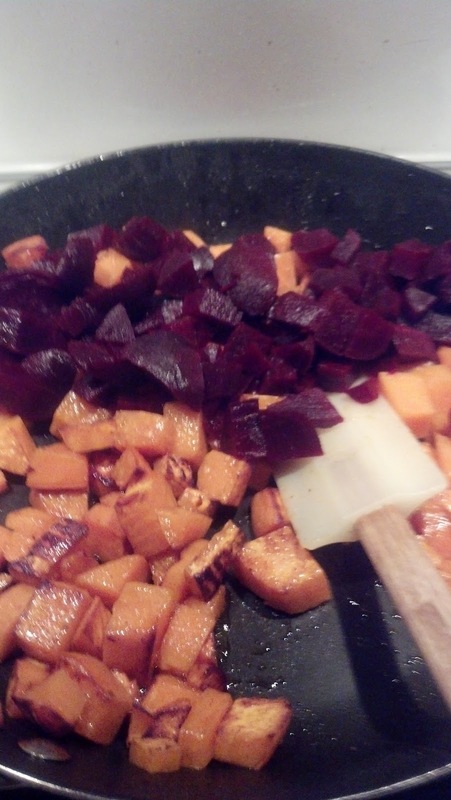 When golden brown on both sides add Beets that are also chopped into nickle size cubes. Next stir and cover for about 5 min. Serve over Rice with Salmon or Grilled chicken you decide. How will you serve your Sweet Potato Bacon Beet Salsa ? This week our host is Pam from The Meltaways and Pam loves October and all things Orange! She challenged the Sunday Supper Team to share their favorite Orange Recipe. Who knew there could be so many amazing orange recipes. Leave it to the Sunday Supper Team to come up with so many delicious Orange options. Can you believe we had close to 60 recipes submitted for this week’s #SundaySupper Event? Pam’s love for spending time Around the Family Table is evident in her posts on her site. Join us for Orange Autumn Recipes this week and share your favorite #SundaySupper with us during our chat at 7pm eastern time. There’s always room for one more Around the Family Table. 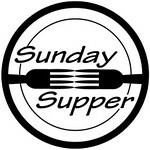 We would be honored to have you join us on Twitter throughout the day during #SundaySupper. what an interesting combination - I would never have thought of it! Thank you so much for joining in this week! I like beets a lot, with bacon they must be a sure hit! Have a nice sunday! YUMMY! This sounds so good Sheila! I would never have thought of this combination - so clever! Thanks for sharing it! I love that you added beets! What a compliment to the sweet potato!! I love all of the ingredients - sounds simply amazing! 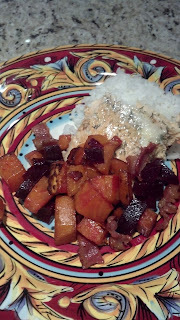 I love sweet potato, bacon and beets!! So this is right up there for me. Thanks for sharing on #SundaySupper. I think I would just eat this straight! I love beets Sheila and I would love to try this! Sweet potatoes with bacon - oh yea! Delish! 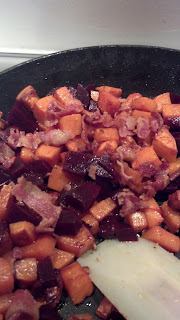 Love sweet potatoes with bacon - what a great combo. I'd have never thought about this exact combination but I'm definitely intrigued because darnit it, it has bacon - and bacon... makes absolutely everything amazing. Great recipe. 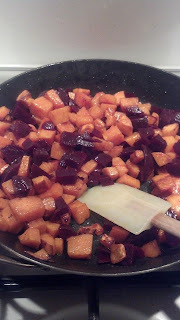 I really like the idea of sweet potatoes with beets. I don't think I've ever put them together before. And with bacon? Fuggedaboutit! Wow, this makes an awesome holiday condiment! I already love beets, but the addition of sweet potatoes and bacon just pushed it over the top to amazing. I love this combo idea, Sheila! Thanks for sharing it! This looks absolutely wonderful! Thanks for sharing. Dang, what is it about bacon in title that just makes my eyes pop out? Great flavor combinations! What a great combination! I would not have thought of using beets here, but what a good idea. We always get a ton of beets in our CSA box over the winter and I'm constantly looking for creative ways to cook them. This is perfect - thanks for the idea! 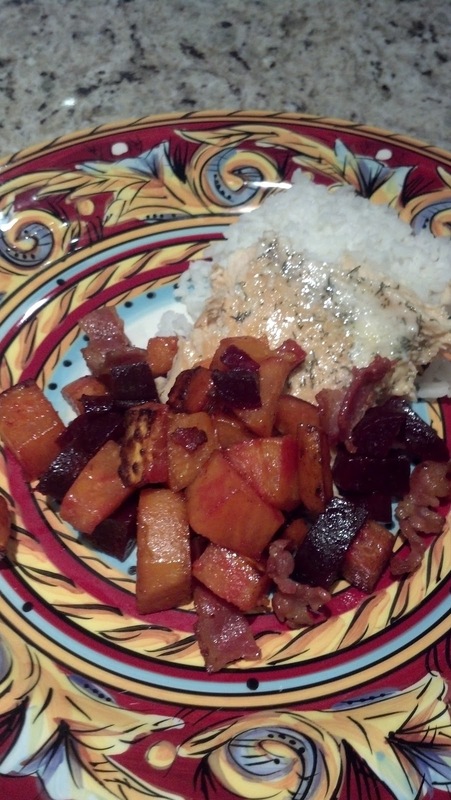 Beets are one of my favorites, I never thought of adding bacon to them! Yummm!!!! What an interesting recipe! Anything is better with Bacon! hahaha! Love beets & this is such a cool way to use them. Bacon adds such a crunch to it !!! Mmmm.. will be trying this ! Yumm ! What a great idea!! I love the flavor and the color combination! What an interesting idea! Never would have put sweet potatoes in a salsa. Great addition to weekend snacking! I prefer to serve over Rice with Salmon! 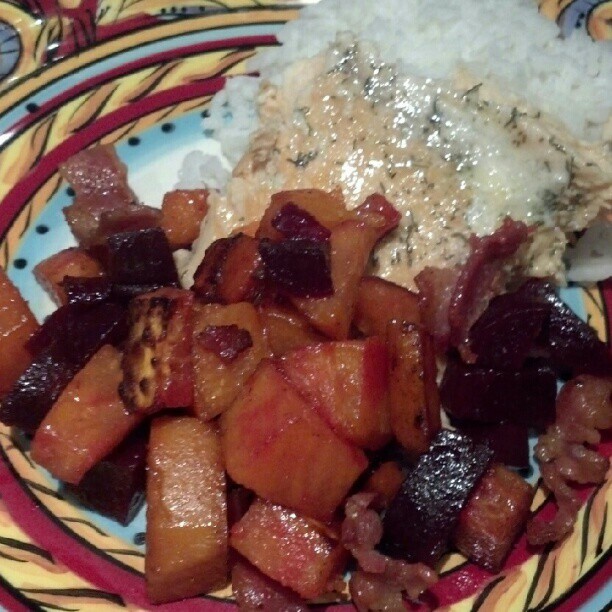 Great sweet potatoes bacon beet salsa! I love this side dish. So simple yet delicious! Oh yummy! What a great combination of ingredients! Love the colors in this dish! This is definitely an interesting take on salsa. I love beets, but would have never thought to pair them with sweet potatoes.